Elasticated trousers. Wig is styled after cartoon Shaggy hair, wild and crimped, not movie Shaggy hair as shown in the picture. Scooby Doo wouldn't be brave enough to track down the baddies without his good pal Shaggy! Stay away from the Scooby Snacks when you're wearing this Shaggy Costume, or the rest of Mystery Inc might with they'd left you in the Mystery Mobile! 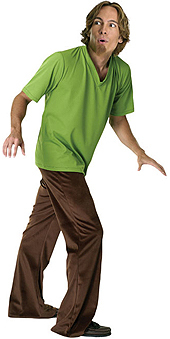 Just like Shaggy from the original Scooby Doo cartoon, this costume has crazy hair and a slight flare on the pants.